E-cigarettes are less toxic and safer to use compared to conventional cigarettes, according to research published in Annals of Internal Medicine. 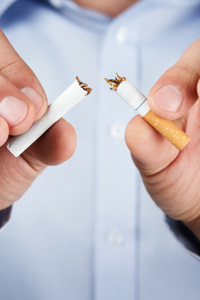 Cancer Research UK-funded scientists found that people who swapped smoking regular cigarettes for e-cigarettes or nicotine replacement therapy (NRT) for at least six months, had much lower levels of toxic and cancer causing substances in their body than people who continued to use conventional cigarettes. For the first time, researchers analysed the saliva and urine of long-term e-cigarette and NRT users, as well as smokers, and compared body-level exposure to key chemicals. Ex-smokers who switched to e-cigarettes or NRT had significantly lower levels of toxic chemicals and carcinogens in their body compared to people who continued to smoke tobacco cigarettes. But, those who used e-cigarettes or NRT while continuing to smoke, did not show the same marked differences, highlighting that a complete switch is needed to reduce exposure to toxins.